Pocket reduction surgery is the treatment for advanced gum disease. 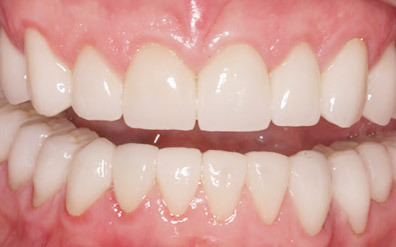 Advanced gum disease causes deep pockets to form around teeth making it impossible to effectively clean out the bacteria with regular brushing and flossing technique. On a localized level, this can lead to more gum recession and bone resorption, which causes eventual loss of teeth. On a systemic level, studies show that uncontrolled periodontal inflammation can affect other parts of the body, such as the heart and the pancreas. Evidence also supports the link between pregnancy and gum disease, suggesting that it can lead to premature or low-birth babies. The pocket reduction treatment consists of reflecting the gums around the affected teeth and reshaping the bone in order to eliminate the damage caused by bacteria. The surgery is designed to turn deep pockets into shallow pockets that can be cleaned more effectively with brushing and flossing. What can we do in cases when the teeth have suffered extreme bone loss and are in severe jeopardy of extraction? In such cases, Guided Tissue Regeneration (GTR) can be suggested. GTR consists of placement of powdered bone graft and use of a membrane to cover the bone graft. This procedure is utilized during Pocket Reduction Surgeries to treat extremely deep damage in the bone around a particular tooth site. Your periodontist can discuss with you if any such sites exist in your mouth and if you would qualify for this therapy. Often, GTR may be the patient’s last chance to save the tooth in question. Occasionally, the patient’s permanent teeth may not errupt into the mouth. There can be many reasons for such a phenomenon. 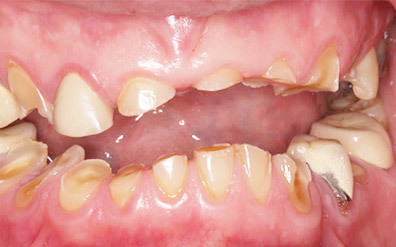 Extreme crowding, trauma, or extra teeth that should not be there can cause this to happen. When this occurs, an Orthodontist will plan to extrude (or ‘pull’) the teeth into the mouth. To be able to achieve this extruding action, a periodontist would need to expose the tooth and eliminate the obstruction to create the pathway for the tooth. Once the pathway is created, an orthodontic link will be bonded to the un-errupted tooth, allowing the tooth to be moved into the mouth over a few weeks.